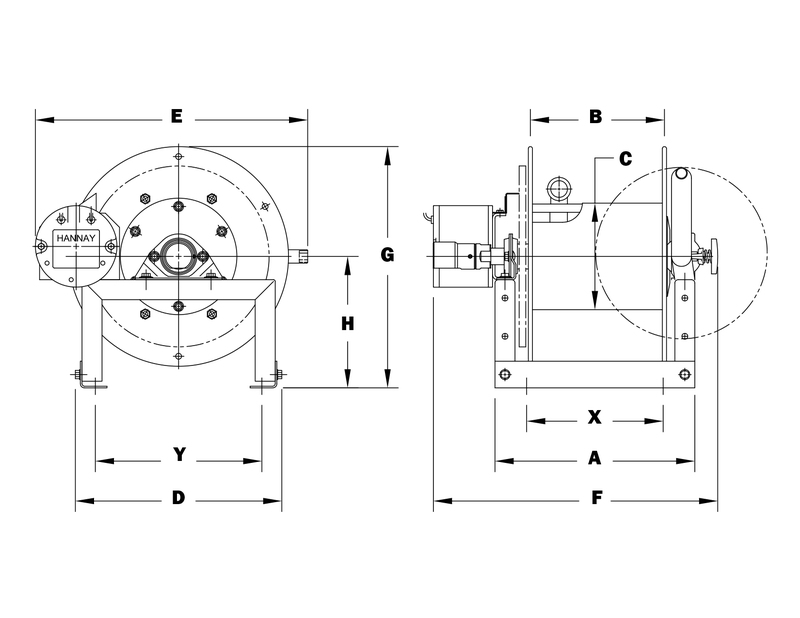 Upon request, reels can be supplied with drum lengths other than shown. Weights shown in chart are for crank rewind models. Add 18 lbs. for power rewind. Dimension "F" is the overall length of standard model reels. When ordering power rewind models, prefix model number with: A = Air Rewind, E = Electric Rewind, HD = Hydraulic Rewind. Air rewind reels are supplied with control valve and 18" air hose; 12v and 24v DC rewind reels are supplied with switch and solenoid; 115v AC rewind reels are not supplied with switch but can be ordered separately; hydraulic rewind reels are not supplied with control valve.